On June 8th the UK goes to back to the polling booths for a General Election. The political campaigns do not look very interesting, and the most interesting political figure in the Election is not a politician but a campaigning business woman: Gina Miller, who took the government to court over the way they tried to begin ‘Brexit’ without involving Parliament. 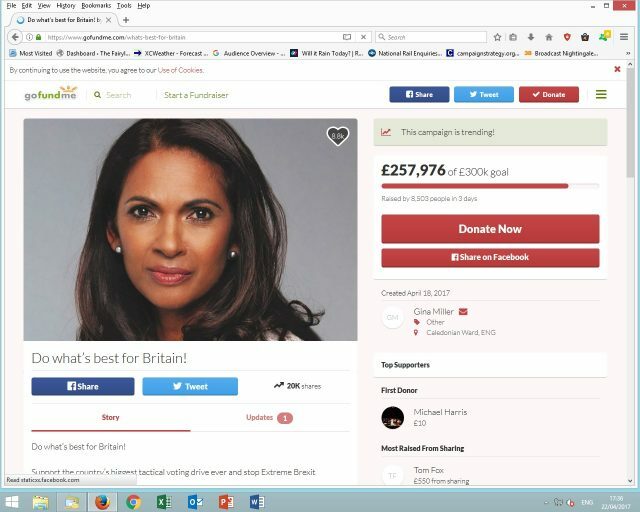 Last week Miller launched a crowd-funding appeal ‘Best for Britain’ at https://www.gofundme.com/whats-best-for-britain. In a few days it has raised nearly £300,000, and more important than the money – for Miller is herself reportedly rich and no doubt has many wealthy sympathetic friends – it has generated a lot of media attention, in newspapers which are pro-Brexit but which focus on how successful her fundraising has been. This of course adds credibility to her project as it’s a success. So far there are (sensibly) few details about Miller’s campaign but there are a number of reasons why it ought to give politicians pause for thought. Here are four. Conventional analysis has it that the Conservative Party should win by a landslide, as Labour is divided and has a hugely unpopular ‘hard-left’ leader massively out of tune with most of the electorate. By the same token the SNP will dominate Scotland but have no head-room to do any better and Britain’s ‘third party’ the Liberal Democrats, with a pro-European policy, are generally expected to win back some of the many seats they lost at the last General Election but voter-geography and the UK’s ‘first-past-the-post’ system means they will still struggle to make much of an impact in most Tory-dominated areas. The same factors bedevil UKIP, only they are also falling apart, and the Greens will do very well to add one or two MPs alongside their only charismatic figure, Brighton MP Caroline Lucas. All this means that the election could look very much like a ‘done deal’, a ‘coronation’ rather than an election, and thus rather boring. The political classes will anyway find it fascinating but Britain’s public are not very political: only 2-3% put ‘my politics’ in their top three factors defining ‘my identity’. And that means that Miller’s ‘single issue’ campaign, just might become something interesting that the press and public find it hard to ignore. Theresa May took a gamble when she called the election last week by declaring that “The country is coming together but Westminster is not” and so Britain needs an election to ‘make a success’ of Brexit. That could prove a hostage-to-fortune for May as many of the 48% who voted ‘Remain’, remain thoroughly unconvinced, and feel that the country was swindled and misled. Even some of those who voted to leave the EU, acknowledge that the practical consequences are turning out to be a lot more ‘complicated’ than they imagined. Miller is in effect the leader, the figurehead for ‘the 48%’, that the political classes have failed to provide. Theresa May, or principally her shoes, have featured in numerous photographs in Vogue magazine. Gina Miller on the other hand got an article explaining the launch of her campaign in Vogue last week, by Arts and Lifestyle editor Katie Berrington. Miller obviously will draw a lot of her support from Pioneers, who as has been described in several previous blogs (for instance Brexit Values Story Part 1), seem certain to have voted overwhelmingly to Remain. But she also has the potential to appeal to Prospectors, Britain’s archetypal swing-voter psychodemographic. It was the Prospector support that Labour fatally lost before the last General Election. Tony Blair appealed to Prospectors as well as drawing support from many Settlers and Pioneers. Jeremy Corbyn has very little appeal to them, after all, “looking good” and “visible success” are two rather important Prospector criteria. There is no doubt that being good-looking may cause resentment among peers and pundits but is an advantage when it comes to selling yourself as the purveyor of a political idea. In January a study by two German researchers found that conservative right-leaning politicians were generally more attractive than left-leaning ones in Europe, North America and Australia. They offered a credible economic explanation, namely that more attractive people got on in life more easily and having become wealthier, tended to support political parties which favoured the rich. As J K Galbraith said (something like) ‘Of all the things that can be said about redistribution of wealth, one thing is true, and that is that the rich have generally been against it’. 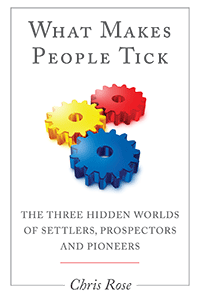 There is another equally simple explanation: Prospectors are success oriented and thus many are attracted to keeping the rewards of their efforts and thus supporting right-leaning parties, and all Prospectors tend to look their best, better groomed and presented, as it matters more to them than Settlers or Pioneers. Unlike some other pro-European business people who ventured into the Referendum campaign, the glamorous Miller is also eloquent, calm under fire from aggressive interviewers, puts herself in the shoes of ‘thoughful’ members of the public, and is based in the UK. She is seen outside the High Court in London rather than lending endorsement from a mansion in the Caribbean. If Miller succeeds in convincing Prospectors, and especially Now People who were much more pro-EU, to now vote tactically, she will stand a much greater chance of success. A lot will depend upon who comes out to support her, and what they look like. In contrast, Mrs May’s dour sense of duty will not cut much ice with Prospectors if they also sense that their own prospects of success look worse under a hard Brexit: she may be hoping that the election will come too soon for that to sink in. 4. Tactical Voting Comes out of the Closet ? Tactical voting has long been a love-child of the geeks and nerds of the UK political classes. They have been the only people to believe that uber-rationalist political calculation could overcome the political dopamines and serotonins of party tribalism, fear, ease, habit, complacency and wishful thinking. The EU Referendum however may have changed that. Friends of friends who have never taken any instrumental interest in politics all their lives, are now actively discussing tactical voting on Facebook and trying to understand such basics as the difference between Council Elections and General Elections. Young people are also more political than they have been for generations. The political problem with tactical voting in the British context (unlike for instance in France where there have long been de facto political agreements to shut out the FN), has always been that tribal hatreds between activists in parties such as Labour and the Liberal Democrats (and more lately the Greens) have prevented any sort of working agreements to let one or another party put up a candidate ‘unopposed’ in order to defeat a Conservative. Hence the ‘left’ and ‘progressives’ have remained spilt, and ‘let the Tories in’. I’m told this is exactly what happened after the Referendum when some mix of the Greens, the LibDems and the SNP tried to convince the Labour Party to start a new ‘progressive alliance’. Corbyn and his people said ‘no’. The difference with ‘Best for Britain’ is that it is not led by tribal politicians but by an outsider with no political baggage but a track record, unlike almost every MP except a handful like Conservative Ken Clarke and Green Caroline Lucas, of being seen to actually stand up to the government over Brexit. Miller came out swinging but MPs did not. Most MPs may be pro-Remain but their commitment to party, their fear of political repercussions or their commitment to representing the views of the majority of their constituents (if not their voters), led them to do nothing that most of the public would have noticed as effective opposition to the May strategy of Brexit-means-Brexit. Miller may now have given them a way, as a political friend of mine once put it, to “stand up without being counted”. I do not know what Miller’s campaign will actually involve but she has given tactical voting a new purpose and a non-party-political figurehead. It is possible that she could do the impossible but it will at least be very interesting to watch.